machines. Each one is built to meet exacting tolerances, using only the best rubber compounds and a tough ARAMAX cord for added resilience. A superior choice for today's demanding trail and touring rider. State of the art rubber compounds reinforced with Aramid fiber delivers unmatched performance. Xtreme is built for tough rider demands. Equally at home in deep powder or hard pack conditions, it's built for extra long wear and dependability for the trail rider, or white knuckle high performance for the rough rider. Power clutching? No problem. run a thousand mile week, or high mark to the top of the mountain. The heart of the Xtreme belt is a breakthrough in compounding technology. Xtreme is built with high-tech materials including Kevlar tensile cords, the same material used in bullet proof vests. Both laboratory and field tests show Xtreme is the best performance belt on the market Xtreme outperforms competitive belts two-to-one in lab endurance tests. 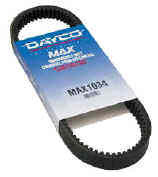 on today's high performance automotive, snowmobile, motorcycle and other motorized vehicle drive belts. Other cleaners such as alcohol, acetone, mineral spirits or even soapy water can attach high tech cord adhesives and materials, causing permature belt wear and failure. Cleaner safely removes belt impurities while leaving behind no film, oils or residue. Packaged in convenient 4 oz squeeze bottles.